Learn from your tracked time and make your work hours more productive with tracking on unlimited projects. Generate visually pleasing time reports that give a clear overview of your work and help you track your projects. A visually pleasing presentation of your time tracking data grouped by different categories. Get fast insight into your or your teams’ performance. Detailed information about your time tracking in the table can be customized and filtered so it fits your needs. All the data you need in a neatly organized format and always at your fingertips. The report offers a birds-eye-view of budget, total hours and billable amount for every project. 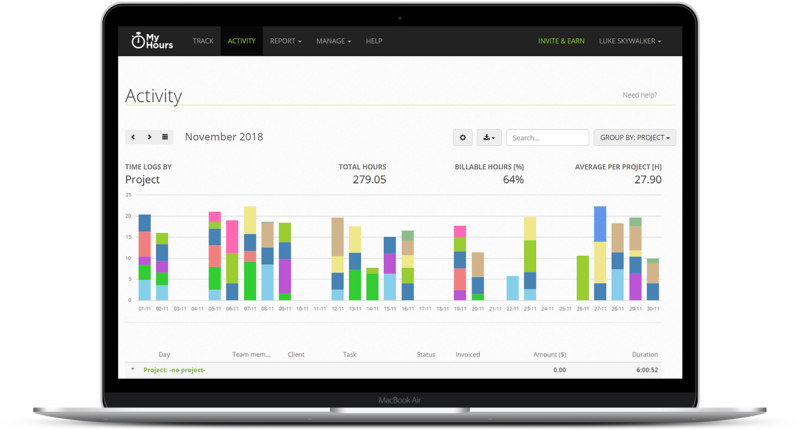 All your project tracking data in one place to help you find non-profitable projects and stay within your budget. Figure our how much time each team member spent on projects, tasks or clients in the specific time range. Get more information about team members based on two variables (team member + project/task/client). The dashboard totals report shows total amounts of time and money spent in a time period. The structure report shows the percentage of how project, tasks, clients or team members used the total time and money.